This article was written By Andrew Nette on 09 Aug 2011, and is filed under Reviews. Andrew Nette is a writer and film buff based in Melbourne, Australia. His blog Pulp Curry focuses on crime fiction and film from Asia and Australia. South Korea seems to be leading the pack at the moment in terms of knocking out top-notch crime movies that are not afraid to play with genres. Take, for example, The Yellow Sea. This 156-minute film starts off as a tightly plotted and gritty neo noir, transforming half way through into a blood soaked chase/revenge movie. Topping it off is a big dollop of social realism about the plight of Chinese of Korean decent or the joseonjok. The Yellow Sea begins in Yanji, a city in the Chinese region between North Korea and Russia. It’s your standard Chinese industrial town, endless rows of anonymous apartment blocks swathed in low hanging haze. Gu-Nam is a joseonjok taxi driver whose life is rapidly disintegrating. He’s heard nothing from his wife since she left to work in Seoul six months earlier. Gu-Nam strongly suspects he is being cuckolded and has drunken dreams about her sleeping with other men. More seriously, he’s racked up 60,000 yuan in mah-jong gambling debts to a fearsome local gangster and human trafficker, Myun-Ga, who offers to wipe out Gu-Nam’s debt if he agrees to go to Seoul and kill a man. It’s a chance for Gu-Nam to start again and there’s also the lure of being able to search for his missing wife in the capital city. Myun-Ga organises for his newly recruited hit man to be smuggled across the Yellow Sea into South Korea, a truly harrowing journey, in the hold of an old tug boat, graphically depicted in a series of short, sharp scenes. Upon Gu-Nam’s arrival, one of the human traffickers bluntly tells him the return boat will leave in ten days, “It won’t wait.” The deadline for his mission established, Gu-Nam travels to Seoul to find his target. All he has is a gun and a name and address. Gu-Nam divides his time casing the apartment block where his target lives and looking for his wife in the back streets of Seoul’s Joseonjok Town, ticking off the days until his departure on an old calendar on the wall of the flop house room he sleeps in. Just as time is running out and Gu-Nam finally steels himself to kill, someone beats him to it. Gu-Nam is now a fugitive. The South Korean police want him for the murder. The local mob boss, who hired him via Myun-Ga, wants him dead because Gu-Nam witnessed the murder and might lead the police to him. Gu-Nam’s situation becomes even more serious when the South Korean mob boss tells Myun-Ga to come to South Korea and personally take care of his AWOL assassin. 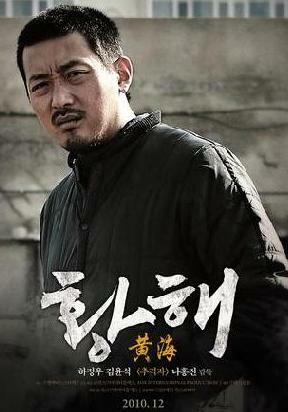 The Yellow Sea was written and directed by Hong-Jin Na, a rising star of South Korean cinema who also directed 2008’s The Chaser, about a dirty cop turned pimp who has to hunt down a serial killer responsible for murdering his girls. Na displays amazing technical prowess in The Yellow Sea, including a scene with a massive car pile up involving a tractor. There’s also some genuinely nail biting chase scenes as Myun-Ga pursues Gu-Nam Terminator-like across the bleak landscape of industrial Seoul. Ramping up the physical violence, the characters only use knives. There’s hardly a gun in sight, despite the fact that we are in high-tech South Korea. It’s as though Hong-Jin Na wants to take us back to a primeval time when people settled scores with whatever weapons they had at their disposal. For the most part, it works, but The Yellow Sea is far too long and the ever-escalating conflict gradually shifts from being suspenseful to disjointed and slightly laboured. Throw in Gu-Nam’s almost dream like pursuit of his dead wife, who may or may not have been murdered, and it ends in confusion. Andrew Nette is a writer and film buff based in Melbourne, Australia. He blog, Pulp Curry, focuses on crime fiction and film from Asia and Australia.